On the pages of Science Magazine (comment and response), Twitter, the University of Washington’s Sustainable Fisheries blog, and The Atlantic, my co-authors and I have engaged in a healthy debate with University of Washington researchers about how to measure the global footprint of fisheries. This exchange has helped raise awareness of different ways to measure, understand, and communicate the extent of fishing. I disagree with much but not all of the scientific criticisms of our estimate and comparison, and in this blog I respond to some of the comments, including longer, more detailed responses at the bottom of the post. Ultimately, though, “area fished” is a poorly defined term, and as a result, this debate is largely about how we communicate fishing to the public. I also want to emphasize that while I disagree with some of Amoroso’s comments, it’s exciting to see him and his colleagues at the University of Washington use our data. Their work to understand the trawling footprint is critically important and I look forward to seeing more of it. In our paper, we tracked the movements of a few tens of thousands of the largest fishing vessels in the world, developing the first global maps of fishing effort derived from vessel movements. While these vessels account for only a small fraction of the world’s fishing vessels, they include the majority of fishing vessels larger than 24 meters (about 80 feet), and they are responsible for the majority of fishing effort in the high seas. 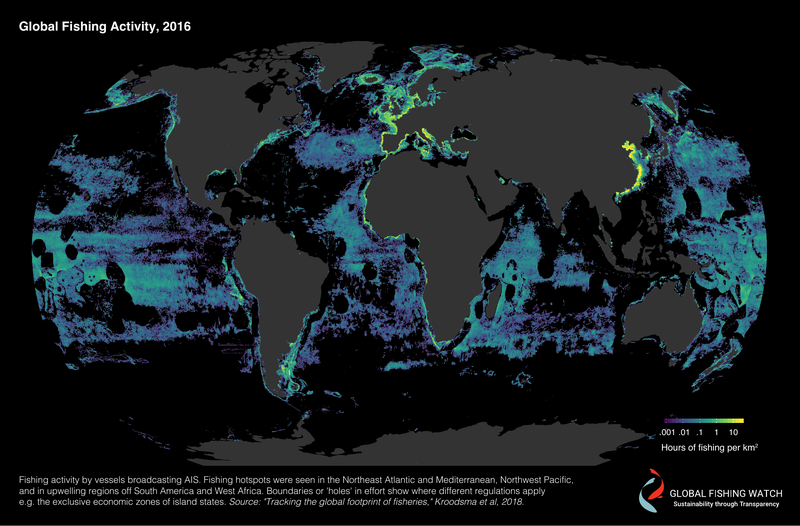 It’s an exciting dataset that is already advancing our understanding of fishing in the world’s oceans, and we hope University of Washington researchers will use the dataset and help us improve it — and we welcome collaboration to this end. To describe the extent of this fishing effort, we divided the world’s oceans into over 160,000 equally sized cells, each a bit over 30 miles on a side. We saw fishing activity in over half of these cells. We didn’t choose this grid cell arbitrarily — it was a balance between how different fishing gears act at different scales, and we expounded on this choice in our supplemental materials (see p. 15 and 16). Drifting longlines set lines of hooks that can be as much as 60 miles long (twice our grid size), while trawlers act more localized. This grid size also allowed us to compare with previous datasets, as noted by the University of Washington blog, but it was not the only driver in our decision. We then compared the area in agriculture with that in fishing. It is important to understand what “area in agriculture” means. In and of itself, it is not a measure of “impact,” and the comments by Amoroso et al. and the University of Washington blog about how it is better to measure the “diffuse” versus “direct” impacts misses the point of the comparison. The majority of area in agriculture is grazing land. Some of this land is former Amazon jungle that was cleared for cattle — arguably one of the worst forms of food production there is. Other grazing land is in parts of the U.S. west where cattle have merely replaced the ecological niche of bison, leaving an otherwise well intact ecosystem, and many environmental organizations fight to keep this land from being developed because of its conservation value. The “area” is simply the area where some portion of the ecosystems production becomes food, directly or indirectly. To compare the area in food production on land with the ocean, the meaningful comparison is the size of the ecosystem supporting the fish we catch. On land we measure the area the cattle graze, not the roads that are built to transport the cattle. It is the area where ecosystem production results in food. Given that the average fish targeted by vessels in our database travels much farther than 30 miles in a year, and that we are missing the majority of coastal vessels — and that about 20 percent of the ocean has either poor satellite coverage or is in regions where few vessels use tracking devices — we considered our estimate that half the ocean supports fishing to be conservative. More generally, this debate has highlighted issues with the term “area fished.” My background is in earth systems science, and to me area fished means the extent of ecosystem meaningfully providing fish for human use. While fisheries scientists have a specific meaning for area fished for trawling—it is the area of the seafloor the trawl sweeps—the definition for area fished for other gears, such as purse seines or longlines, is less clear, and through this conversation, I’ve become convinced that fisheries scientists don’t have a clear definition for “area fished” for non-trawl gears. What is the area fished of a hook on a drifting longine? What is the area fished for a purse seine that uses fish aggregating devices to attract fish? While I contest that my definition, “the area of ecosystem supporting fish,” is a consistent definition across gear types and for comparing with terrestrial food production, others obviously disagree. As such, “area fished” is a poorly defined term. At the bottom of this post I’ve included more detailed scientific comments/criticisms about our calculation and how we respond. But as much of the debate is about the definition of “area fished,” and as almost no one manages fisheries for “area fished,” this debate is really about how these headlines are interpreted by the public. The reason, I believe, that our paper resonated with the press is that the scale of fishing in the world’s oceans is truly impressive. The vessels we tracked, in one year, traversed a combined distance equal to traveling to the moon and back 600 times. And, dividing the ocean into over 160,000 equally sized cells, we see fishing in half of them. The maps of fishing effort speak for themselves–fishing’s extent is global and impressive. In our communications we sought to share this awe. Is it misleading to say that over half of the ocean’s area is fished? If people think of it as the area that is physically swept by gear, then yes, it is. But that isn’t how I thought of it and also not how I think the public thinks of it. Most people don’t know what a drifting longline or purse seine vessel is. So, the question becomes, is it misleading to suggest that fishing occurs across more than half the ocean? I think “half the ocean” conveys the vast spatial extent of the fishing fleet we tracked, and it definitely conveys the area of ecosystems fished. By other measures, completely apart from our analysis, “half the ocean is fished” does convey meaningful information. One recent paper estimates that the biomass of non-deep water fish (non-mesopelagic fish) in the ocean has been cut in half by fishing. This estimate (which has a good deal of uncertainty) shouldn’t be too surprising, as when a fishery is managed to maximize the yearly catch, in a way that is “sustainable,” the biomass is usually cut by at least half. But even if it is sustainable it means that, excluding deep water fish, we’ve literally fished half the fish in the sea. If managed well, seafood harvested from our ocean is the ultimate renewable resource, and it’s vital to supporting the protein needs and livelihoods of some of the most vulnerable and poorest people on the planet. Many forms of fishing are environmentally friendly compared to livestock production, and some forms of seafood are even better than a vegan diet. Fishing brings incredible benefit to human society and we need a thriving industry to help feed the world. Unfortunately, our management of the world’s ocean’s leaves much to be desired. Although many fisheries, especially those in the developed world, are well managed, many others are not. About a third of fisheries are officially overfished, and about half have been fished above the level optimal for food production. Fishing threatens sea birds, mammals, and sea turtles, who become ensnared by nets and hooks as by-catch. If fishing pressure was substantially reduced globally, many of these endangered animals could recover, while also increasing fishing profits because fish stocks would increase. Illegal, unreported, and unregulated fishing accounts for a substantial portion of global catch, and perhaps most egregious, a few fleets are powered through forced labor, literally engaging in slavery at sea. The University of Washington blog lists a number of myths that overstate the environmental impact of fishing, and argues that we must do a better job communicating. I agree, but I also think these stories have persisted because real problems in the ocean have made people susceptible to believing myths or half-truths. The solution isn’t to reanalyze the data to say a much smaller percentage of ocean is fished; it’s to improve the way we manage the ocean and increase transparency. If we can eliminate overfishing, protect biodiversity, and end illegal practices at a global scale, when people hear that “half the ocean is fished,” they will think that this statistic represents something good and healthy. Increasing transparency is critical to these goals. Through transparency, we can demonstrate that responsible fishing is following best practices from an environmental, economic, and social standpoint. Armed with facts about where their vessels are going, the fishing industry can make clearer arguments to the public about their practices and fight back against falsehoods–and those who aren’t following the rules will be forced to change their ways. It will be harder for both bad practices and myths about them to persist. This debate over “area fished” demonstrates the importance of transparency. We used our dataset to describe the spatial extent of fishing and the area affected by it, and then we made our data available. Amoroso and his colleagues thought that our analysis did not properly characterize the more localized nature of trawling, so they performed a complementary analysis to ours. The end result is a deeper understanding of fishing’s footprint and a richer conversation with the public. 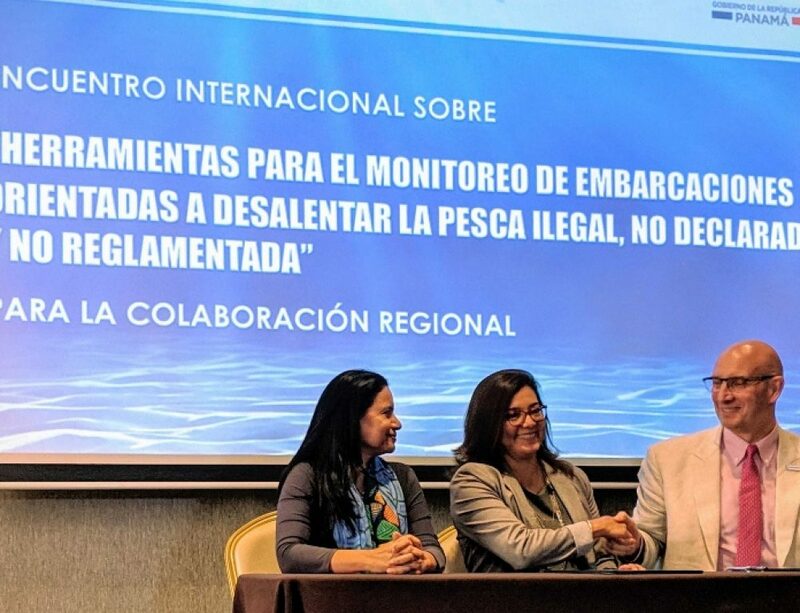 If we address the serious problems facing fishing, eliminating overfishing and illegal practices, then this transparency of data will demonstrate to the world the true state of fishing in the ocean, and no one will interpret fishing’s large footprint negatively. As I said earlier in this blog post, most of the arguments about our area estimation are about the definition of “area fished,” or misunderstood the nature of the comparison with agriculture. Below I offer some more detailed responses. A more obvious problem with the 4% figure is that it suggests that we could close 96% of the ocean to fishing without any impact on food security or the livelihood of fishermen. That seems extremely unlikely. This point was made by the UofW blog, and by some on Twitter. However we don’t eat migrating birds; we eat cattle. Similarly, we eat fish. From an ecological standpoint, I think the only real comparable “area” figure is the area of ecosystem where some significant portion of the yearly plant production (“net primary productivity”) becomes food, either directly (harvesting plants) or indirectly (animals eat plants, and we eat the animals or we eat animals farther up the food chain). We aren’t measuring “area impacted” by fishing, but the area that directly supports it. Many people object to comparing fishing to agriculture, and I agree that we are comparing very different human activities. However, I also argue that different types of agriculture are as different from each other as fishing is from them. Namely, grazing is very different from cropland. In row and orchard crops, the original ecosystem is completely destroyed, and about one third of the plant growth of the new ecosystem is eaten directly by humans. While some grazing land is created by clearing virgin forests, much of it is on natural grassland, and cattle and other livestock co-exist with natural species–and a much smaller portion of the yearly plant growth turns into food for humans. Is it meaningful to add grazing land and cropland into a single measure of “area in agriculture?” Would someone who believes in the ecological value of grazing land get upset when it is revealed that the spatial footprint of grazing is twice that of crops? Again, I think that the only meaningful area comparison between these very different activities is the area where some meaningful portion of the ecosystem’s production becomes food. This portion is likely highest in row crops and lowest in fisheries. This argument sounds good, and was made by many on Twitter, but it actually doesn’t invalidate the comparison. It’s okay to use different grids for measuring different things, as long as the grid sizes are appropriate. For instance, let’s say you wanted to compare the area of paved roads in the world to the area of the ocean. To get the area of roads right, you’d need a very high resolution grid, something on the order of meters. For the oceans, you could use a grid tens of kilometers wide and get an answer that is accurate within a few percentage points. The key is that the grid should be appropriate for what you are measuring. If the footprint of fishing varies over a scale smaller than half a degree, then we should use a smaller grid size for measuring fishing. This argument is, implicitly, what I assume Amoroso et al. are making when they argue against our grid size–they argue that fishing’s effects are more localized and thus need a smaller grid size to measure them. While this argument is true for the “area swept by trawling,” and for some localized coastal species, it is not true for the pelagic ecosystems that dominate our dataset. As we note in our response, the area covered by these pelagic species are orders of magnitude larger than our grid size. Also, there are no fences in the oceans, and we are eating higher up the food chain than on land, meaning that the food supporting a given fish was created across a wider area, and thus a lower-resolution grid can give a relatively good answer. That said, a better version of what we did would vary the grid size by target species (and include the countless boats that don’t broadcast AIS). This argument, made on Twitter, is reasonable, and shows some of the real challenges of the land to ocean comparison. Ideally, the metric would be the area where some meaningful portion of the annual photosynthesis by plants or algae turn into food, either directly through eating the plants/algae, or indirectly by eating the animals higher up in the food chain. The challenge in this definition becomes deciding the right cut off for “meaningful portion.” Many pelagic fish are caught in very low productivity waters, and the highly migratory fish are actually getting some of their food from hundreds of kilometers away. Similarly, there is lots of grazing land on very arid marginal land. A much better way of doing this estimate is to clearly define the cutoff for “meaningful portion” and then perform detailed ecosystem models around the globe combined with species ranges. But these range maps don’t really exist in the needed detail, and I believe that simply looking at where the fishing is happening, and making basic assumptions about how much fish move, gets at this estimate. This point was made on Twitter, and I agree! But it turns out that good distribution maps are actually lacking for much of the ocean, and especially the high seas. One very interesting recent paper used ecological modeling of high seas longline fleets, and found that the ranges of the longlines was less than expected based on environmental variables. One reason, the paper states, for this smaller range is that fishing may have resulted in a range contraction for the target species. Anyway, that’s just a way of saying that using fishing activity to find out where fish are is a reasonable (but not perfect) method. I think this comment is the best criticism of our comparison. We were very clear in the paper that this was how we are measuring fishing activity — if we saw fishing in a cell, we counted it as “fished.” This was partially because we were simply working to explain the extent of the dataset, not the intensity. Another reason is that our database has only a small fraction of the world’s 2.8 million motorized vessels. There are many, many vessels that we don’t see. This is especially true close to shore (where you might want to use a higher resolution grid than our 0.5 degree grid because the fish have smaller ranges). So when we see one vessel fishing, it is likely that there are many other vessels fishing there. This method does, though, make the model susceptible to false positives for fishing effort. An error in the fishing algorithm resulted in squid jigger activity getting classified as “fishing” when they were really transiting. As a result, about 4% of the ocean was classified as fishing when vessels were really transiting through it. We have fixed this in the final release of our data (which is why I’ve changed my language from “>55%” to “over half”), but it shows that our estimate does not have many significant digits behind it. You also see these errors in the marine protected areas in Alaska that Amoroso et al. highlighted in their response. In this case, a research survey vessel — which was fishing, but for scientific purposes — was classified in our database. It did likely fish in the region, and thus the area was “fished” to some degree, even if extremely lightly. This comment comes courtesy of Twitter. It has some truth to it! Our area calculation really is just the best estimate we can devise with our data in an attempt to describe the extent of industrial fishing vessels in our ocean. It is just one finding from one paper where we clearly stated our assumptions. It is unlikely to be perfect, and future research is needed to refine and improve it. Certainty is not the currency of science. We look forward to other researchers building on and improving our work.